Dev looked at Onyxdemon as she teased the other leader and grinned fox-ish. The redhead then turned and looked at the territory, she was as silent and watchful as the wind. Primalstrike's green eyes gazed through the surroundings, a tiny bit of her hoped they came across an monster, she wanted some fun. She tightened her grip on her hands at the thought of it. Devessa then quietly huffed and began walking forward, she turned her orbs to the others. "What are we waiting for?" Swiftfeet held up a finger to his lip. The roars grew louder from the beast. He motioned for them to follow him as he started to move through the back part of the alley. The monster that had locked eyes with Tad was now being pushed back by a larger monster of the same species. "Stay low and follow me. They will occupy each other for a bit." he called as he moved to the half wall. "Climb up and over and wait on the other side." He said as the ground behind them shook with the two giants fighting. "That's why next I'll show you some spices that you can use." He smiled as he kneeled in front of the Kill and pulled out a dagger. The bushes moved and a large fan like limp swiped out at him. It was covered in teeth like spikes and slammed into the ground where Thorn had stood. Thorn had rolled out of way, with her wrapped up inside his arms, his back covering her body. "Adsidy, run!" He shouted as he quickly jumped to his feet and pulled out the spiked whip from off his belt. He slashed it in a large "X" fashion to swayed back the monster that hid in the bushed. The entire time, Tobias watched Tad with a clenched jaw, ready to pounce to his aid if need be. Once the leader rolled back to them, he let out a breath he didn't know he was holding and followed close behind him, glancing back to make sure they were still being followed. He nodded in response to his orders, and climbed up, hopping silently to the other side. The bones of long dead crunched under his feet as he landed on the other side. Stayed on the other side, helping boost people over the wall. Onyxdemon ran over to Tad and he cupped her foot and helped boost her up wards. She straddled the wall and jumped over to the other side. She bit her lip and panted as she looked around. "Primalstrike, you next!" Tad barked out. Tobias had moved to help Onyxdemon, but hesitated, not wanting his hand bit off by the HollowClan member. He glanced at her, "You alright?" The young deputy asked, bracing himself for some sarcastic remark. Onyxdemon nodded and stumbled. "Y-Yeah I'm fine, but I've never seen a monster like that..." She said trying to stabilize her breathing. She shook a little, it was the first time the elder woman had ever felt afraid. Tobias' expression softened, and he stepped forward, resting a gentle hand on the woman's shoulder. "Hey, look at me." He ordered gently, his kind blue eyes locking on hers, "You've got all of us here, and I'm quite positive you can take care of yourself, nothing is going to harm you." He promised, smiling at her, "Except maybe Tad tripping and falling on you." He winked playfully at her. Onyx huffed out a weak attempt at a laugh. "yeah, okay." She said gently. "Let's just find that kid and get the hell out of this place." She said. Tobias chuckled and gave a nod of agreement, eyes sparkling. "Of course." He took his hand off of her shoulder, turning away and taking in the ruined landscape. A frown crossed his face suddenly, and he stepped forward, kneeling on the ground and inspecting something. Fresh, huge monster foot prints were visible on the dirt, and he frowned back up at Onyxdemon. The leader looked at the fellow leader and raised a red brow, before grabbing onto his hand and letting him help her over. Dev ended up close up to him and she rolled her eyes, "tch" the redhead turned away, lightly hitting Swiftfeet with her curly locks before following after Onyxdemon and Tobias. Devessa eyed the tracks and huffed. The young leader crouched down and lightly ran her pale finger tips over them ever so faintly. Primalstrike grumbled to herself quietly before looking at Onyxdemon, her eyes narrowed and hard. I know what this is, she silently muttered knowing with her look her warrior would understand. She stood back up and glanced at Swiftfeet and Goldenfeather and worried for them slightly, but no emotion crossed Dev's face. She sighed and put her hands behind her head going into a relaxed state. "This just reeks of trouble," she hinted to the StormClan members. Devessa eyed the tracks and huffed. The young leader crouched down and lightly ran her pale finger tips over them ever so faintly. Primalstrike grumbled to herself quietly before looking at Onyxdemon, her eyes narrowed and hard. I know what this is, she silently muttered knowing with her look her warrior would understand. She stood back up and glanced at Swiftfeet and Goldenfeather and worried for them slightly, but no emotion crossed Dev's face. She sighed and put her hands behind her head going into a relaxed state. "This just reeks of trouble," she hinted to the StormClan members. Max watched and waited for his leader to be helped up before he climbed up, grunting as he heaved himself over on to the top of the wall before dropping down on the other side. He raised both arms and stretched out his back, turning his torso quickly to either side and hearing the pop and cracks happening as he did so. He hoped they’d find this kid soon and be out of here. Absidy nodded and gave a small smile, excited to learn more. But all of that quickly disappeared when another monster came out of nowhere. She gave a help of surprise as he mentor grabbed her and rolled out of the way, feeling his body protecting her as he shouted for her to run, and that’s exactly what she did. As soon as Thornwhip jumped up, Absidy shot out and was running away as fast as she could, most likely heading back for the camp. Her heart was racing, her feet pounding the ground as adrenaline rushed throughout her whole self. The ground shook as Tad helped the group gather over the wall. There was a blood curdling screech as one of the monster's won the fight. The larger of the two, the new comer slammed into the alley as it watched Max climbed onto the wall. Tad fell to a knee from the shaking. He pulled out the sword to help stabilize him. The monster roared and reached a clawed foot into the alley way. Tad slashed at the hand with the sword but the creature just back handed it away. It slammed it's paw down onto Tad and pinned him underneath it. Tad let out a gasp as he was pinned under the paw. He blacked out from the weight of the massive paw. It placed it's front feet on the wall as it peered over the wall at the others and hissed showing off two sets of teeth inside it's jaws. It started to raise itself over the wall. Thorn backed up slowly trying to keep the monster at bay. The flat tail swung at Thorn and caught his tail, knocking him down and throwing him to the ground. The teeth on the tail sank into his leg. Max stumbled back as he heard the screeching again, looking over to the wall as he felt the ground shaking as the bigger monster raced towards them. "You've got to be kidding me." He groaned, knowing that Swiftfeet was still on the other side. His eyes widen as he watches the creature start to pull itself over to their side, and Jaggedthorn immediately draws his sword, holding it out defensively in front of him. "Looks like we've got some bigger fish to fry. We need to lure it away, someone stay here to check on Swiftfeet, make sure he's still alive." He tells the others, starting to back away. Absidy slowed to a stop, panting heavily and she looked behind her. Nothing was chasing her, but her mentor also wasn't behind her either. "Thornwhip!" She called out, a bitter taste starting in her mouth when she didn't get a response. The young girl bites her lip and starts to head back, her hatchet in her hand, the blade still stained with the Avem monsters blood. Hearing the mess Dev whipped her head around, she ran back over and her eyes widened as she saw Swiftfeet. Primalstrike mind went into a furry as different thoughts swarmed her head. Then a doggish grin crossed the leader's face. She heard her deputy speak and stared at him with the grin still glued to her pale face. "I'm one of the fastest here so I'll distract," that wasn't really her offering, that was her telling them. The redhead drew her hatchet and dagger and did a bit of an excited dance. "Come here!" She shrieked as she went back over the other side, as she landed her eyes met the monsters. You are very ugly, she silently stated before crouching down, her dagger by her hip while raising her hatchet up. Come on...come on she narrowed her green orbs and started to sway. The monster started to notice her. "I'm much prettier than him, I'd taste a whole lot better" Devessa spoke just for a moment her eyes flicked to Tad before lunging forward, she acted like she was gonna attack the monster with her hatchet instead her dagger lunged forward and sliced lightly at it's paw and it let out an annoyed hiss. Seeing the blood and smelling it got Primalstrike even more excited. She slid on a wicked smile, tice the young HollowClan leader and growled loudly. The veins popping out on her face, her eyes narrowed but wide. Her smile was so wide her tongue dangled out. "Come on you freak!" She called out from a distance. The eyeless monster looked at them clicking loudly as it located them. It rose a little higher over the wall. In the second sets of arms one of the hands gripped and was carrying Swiftfeet by the head. He was bleeding from where the two claws pierces the skin of his head. Swiftfeet groaned and shifted as he opened one eye in an attempt to look around at them. He blinked away the blood that fell into his eye. He shifted and his arm jerked suddenly. The tip of his blade swung up and stuck itself into the side of the monster. It roared and screamed as gray blood dripped and pooled out of it. It looked back at the wound and screamed. It's second arm took Tad and tossed him at the others. The monster turned back down the alley way and took off, leading a trail of blood. Tad hit the wall and then fell to the ground next to the feet of the others. He coughed and started to push himself up right as he coughed up a small amount of blood. As she neared the bushes they had hidden in moments ago, she could hear the muffled shouts of pain from her mentor and the tears of cloth and flesh. The monster had pinned Thorn's head and legs down with it's paw. The flat tail covered in serrated teeth was raking down the back of Thorn as it ripped and pulled up strips of flesh. Tobias darted to Tad's side, helping his leader up, "You okay?" He asked, voice dripping with concern, blue eyes watching the beast. He kept his free hand on the hilt of his sword, which he had drawn when the monster first attacked. Dev looked to Swiftfeet and made her way over to the two StormClan members, her green gaze stared at the blood from Tad. Seeing it made her eyes narrow but keep wide, her tongue slipping out of her mouth as it formed a doggish grin. Primalstrike turned and looked at her clan members before nodding back and looking to where the monster took off. Her craving grew so strong she couldn't resist. "Be right back..." she mumbled before taking off, following the monster's tracks. You are mine! She thought excitedly as the redhead raced after it. "PRIMALS-!" Tad shouted as she took off back over the wall. He spat up more blood. "Damn it, some one stop her!" he hissed as he held his side. "Don't split the group!" He hissed as he forced himself to rise up. "Come on we have to get her." He said as he ran over to the wall and pulled himself back up over the wall. "I also need my sword back." He hissed as he started to walk back to the main road. 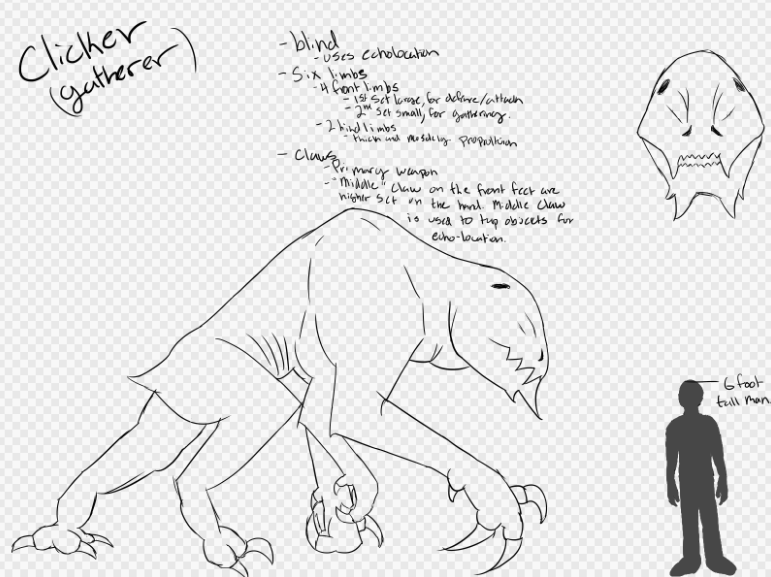 The monster was running down the main road, it's secondary arms carrying the body of it's monster kill from before. a large trail of gray like blood flowed down the road. The hilt of Tadoda's sword still sticking out of it's side. It moved quickly down the road and turned a corner disappearing behind a building. Scar who was traveling across roof tops stopped as he felt the shaking of the ground. He got low and steadied himself as he saw the large monster run by, bleeding. He spotted the glimmer of gold from the handle of the sword. "Oh f***" he cursed as he watched the monster disappear into the underground tunnel it came from. "I can't believe he came up here." Scar sighed as he walked to the edge of the roof and looked down the main road trying to spot his former mentor. Tobias let out a weary sigh, motioning for Onyx and Max to follow, then leapt over the wall himself, racing after Tad. His overcoat flapped in the wind, "Sir!" He called as they ran, "I found Scar!" He motioned up to where Ian was perched on the roofs. Dev slowed down as the monster went behind the building, she removed her weapons from her belt and clutched them. Her dagger in her right hand and her hatchet in her left. The redhead got low as she closed in on the building. Her green eyes filled with lust of death. Tad is gonna be mad that he's gonna have to owe me one, her thoughts weren't making sense as the blood smell filled her nostrils. Primalstrike started to drool a little bit and rounded behind the building. She rested her eyes on the monster and crouched low, her dagger pointed forward and her hatchet raised up. You messed with the wrong fighter, she threatened silently, her green eyes watchful. As she turned the corner the monster was gone, all that was there where the massive ruins of buildings that had fallen down. The only thing in the wide open area was a massive hole that lead underground. Scar watched from the roof top. "Primalstrike!" he called up. "Stop your pursuit." He shouted as he started to make his way down the buildings until he stood in front of her. Tad came running up to them closely. He was panting and bleeding. He looked at Scar and narrowed his eyes. "Stoneheart." He hissed. He walked up to him and threw a punch at his face, hitting Scar in the jaw. "You god damned idiot!" He shouted as he placed his hands on his knees and threw up more blood. "I'll kill you later for this." he coughed.